After coaching thousands of beach volleyball players over the years I’ve recently noticed that I’ve been able to put a few pieces of advice on repeat. There are certain types of errors that run absolutely rampant throughout the amateur population. The interesting thing is that the same mistakes are being made from beginners all the way to AAA players. The difference maker between those groups is usually time and repetitions. At VolleyCamp Hermosa we run training camps and lessons for every level. Book your volleyball training vacation here. Disclaimer: Everyone teaches the game differently. Most people teach how they were taught and this is not always proper. Many people fear the process of seeking new learning opportunities or studying any information that might challenge their beliefs, it can be a blow to the ego. Should you disagree with anything here I will not be offended but as always I recommend you keep an open mind, seek out multiple high level teachers and watch a few thousand hours of film before embarking on your rant. TEACHING for 10 years does NOT necessarily mean you have been LEARNING for 10 years. Don’t search through these words looking for things to criticize. Read them to find something you can use. You can also look at our video tutorials and order your own video analysis package where an AVP player critiques your video for you. Check it out! Problem #1: Inconsistent forearm passing and setting. Mistake: Poorly built and poorly executed platform. Easy Fix: Build your platform earlier and keep it together longer. Most amateurs have a basic understanding of their platform. They know that their elbows need to be straight with their wrists and hands together. A major issue I come across all to often is when they don’t do this early enough. Many players keep their elbows ever so slightly bent until impact. They unconsciously lock their elbows AS they are passing the ball and this creates a forceful bounce with a late unplanned angle. Their angle changes at the last moment every time they pass or bump set. That tiny extension creates inconsistency in the angle and in the type of contact. Instead of having a soft guided touch, this creates a quick bounce off of the arms. We have to get our angle set early so we can create a soft, controlled contact with some consistency. A lot of players also do not get their hands together early enough. They build a platform right before contact and/or release their hands immediately. In this way, it is built sloppily. It’s a rush job and as both a player and a coach I like striving for detailed perfection. Come to one of our camps this summer so we can show you in person. In the mean time, remember that inconsistent platforms create inconsistent passes and sets. Two metaphors can make this easy to relate. Imagine a marksmen shooting at a moving target. A key point in executing an accurate shot is a steady hand. Expert marksmen don’t loosely hold their gun at their waists and then raise their hand in a swooping motion to fire do they? No. They hold themselves as steady as possible while tracking their target to create an opportune moment of total accuracy. This same principle applies to our serve receive and bump setting. The earlier we can build a pure platform with a steady angle, the more consistent we will become over time. The second metaphor has to do with your partner. In serve receive, the setter is trying to find the relationship between the moving ball and your platform. It helps them get a better break on the ball. Similarly, hitters will be watching your bump set contact to get an idea of how/where the ball will come off your forearms. My metaphorical and rhetorical question is this: Is it easier to predict the path of a ball bouncing of a wall or bouncing of another projectile object? When you hold your angles early and true, your partner can get a better earlier read on the ball. Remember that you want to continue this true hold after contact. Practice is your opportunity to “tighten the screws” so nothing comes loose during tournaments. Join us for a private Lesson any time so we can tighten up YOUR game. If you let your hands release and your platform turn into loose noodles on impact, it will eventually happen too soon and you will contact a ball with a broken platform only to be left wondering why you shanked that ball. Models to watch film on: Misty May. John Mayer. Bonus: Use the same principles for chasing free balls, high lines and short shots. “Thanks so much to Mark Burik and VolleyCamp Hermosa for an incredible week of training and hospitality. From teaching a veteran beach volleyball player/coach something new (Bill), providing awesome learning and playing opportunities (Me) and best of all, guiding and training a passionate young player (Sammy), VolleyCamp Hermosa exceeded our expectations and delivered in every way. 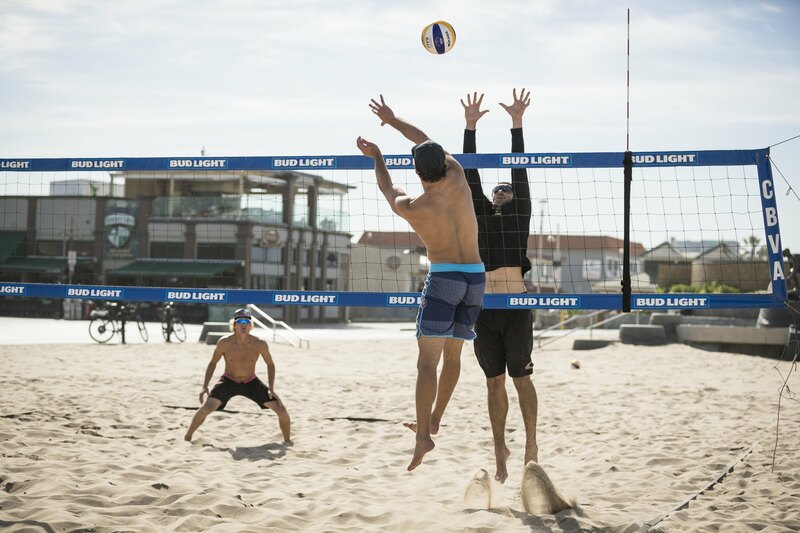 Mark Burik’s outstanding talent, vast knowledge, engaging personality and superior skills all contributed to creating the ultimate interactive (emphasis on active) beach volleyball training experience. Thanks to Mark, our 16 yr old upped his level considerably and saw improved results immediately. Perhaps the most notable of Mark’s traits is his incredible work ethic. This guy works hard, trains hard and competes hard (he had a great finish at the AVP Manhattan Open while we were there ). He demands the best of himself, and asks the same of his students. The overall VolleyCamp Hermosa experience was fantastic. Every aspect of our stay was meticulously orchastrated. Thanks to Mark and his team! You have our highest recommendation.